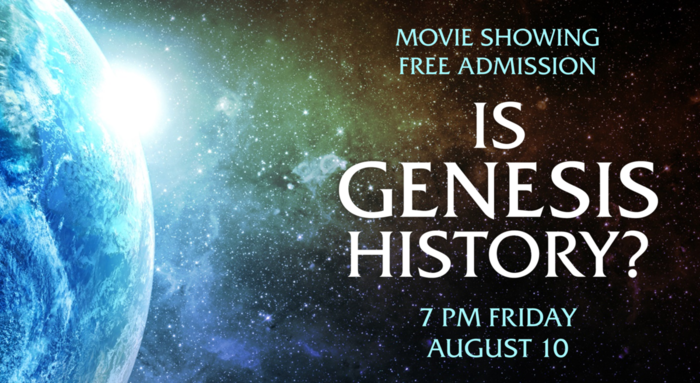 Grace Baptist Church is pleased to present the feature-length movie Is Genesis History? Admission is free but seating in the main auditorium is limited. Is Genesis History? is more than a documentary. It is an engaging exploration of two competing views of natural history. Is what we observe today best explained by natural, uniform processes occuring slowly over billions of years? Or is it best explained by recent, direct actions of God as recorded in the Bible book of Genesis? Dr. Del Tackett, creator of The Truth Project, serves as your guide—hiking through canyons, climbing up mountains, and diving below the sea—to evaluate which of these two competing views best fits the observable data. Is Genesis History? features over a dozen scientists and scholars explaining how the world intersects with the history recorded in Genesis. The cinematography is breathtaking and the arguments are compelling. From rock layers to fossils, from lions to stars, from the Bible to artifacts, this fascinating film will change the way you see the world. The movie is 1 hour 45 minutes long and is appropriate for all ages. An informal seating area will be available for families with young children who might find it hard to sit through the full movie. Light refreshments will be served following the movie. Is Genesis History? was the #1 Christian documentary film of 2017. For more information or to order on DVD or Blu-Ray, visit www.isgenesishistory.com. Artwork and movie trailer © Is Genesis History?